By Scott Gilfoid: Gennady Golovkin’s promoter Tom Loeffler was surprised to learn that Golden Boy Promotions CEO Oscar De La Hoya has already made an offer for Daniel Jacobs to fight Saul Canelo Alvarez for September 15, as he said he was still in negotiations with Golden Boy President Eric Gomez. Loeffler and Gomez were still trying to put together a deal for the Canelo-GGG 2 fight when De La Hoya revealed that he’s already offered Jacobs a deal. Jacobs’ promoter Eddie Hearn has confirmed that they have received an offer from Golden Boy, although the offer is not what they’re looking for. Hearn says Golden Boy is going to need to sweeten the offer for a deal to be done for the Canelo vs. Jacobs fight. Loeffler sees the Canelo-Jacobs fight as merely a fight between two guys that GGG already beat in 2017. So, in other words, the Canelo vs. Jacobs fight is the equivalent of a consolation bracket in which the losers from the Golvokin-Canelo and Golovkin-Jacobs fights battle it out for the second banana position. Golovkin might throw a bone to the winner of the Canelo vs. Jacobs fight by offering them a fight, but it’ll need to be at the right price that suits him. In the case of Canelo, we’re talking about a 50-50 split. For Jacobs, he might be lucky and get a 60-40 split for the Golovkin rematch. Jacobs is going to have to get past Canelo first, and that might be hard to do unless he knocks him out. Canelo does not lose by decision. It doesn’t happen anymore. “I spoke to Eric [Monday night] and we were still in discussions so I think if there’s a way to find a solution we’ll try to find it but I didn’t speak to him [on Tuesday],” Loeffler said to ESPN.com. 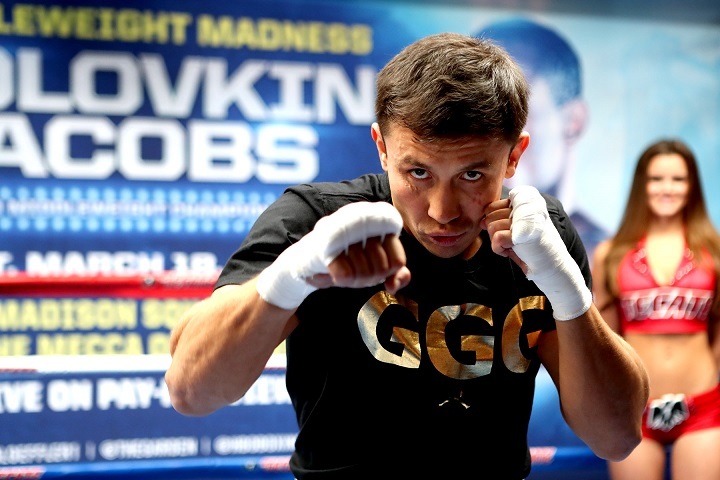 “But 50-50 is the position [Golovkin] has taken. Canelo’s taken his position. It’s our job to figure out if there’s a way to make the fight work. All I can say is that those two guys [Alvarez and Jacobs] are guys GGG already beat last year,” Loeffler said. De La Hoya seems to be trying to prove a point in matching Canelo against Jacobs. I just don’t know that it’s going to drive home the message to GGG, especially if Canelo loses. This will be absolutely hilarious if Canelo gets beaten, and I’m not saying he will. I don’t think Canelo can be beaten by decision. I don’t see a set of judges that would score it against him, because he’s so popular. If Jacobs knocks Canelo out on September15, then that’s going to make De La Hoya look bad for having made the fight. Jacobs hasn’t looked too good lately. I’m not sure that he has enough left in the tank to beat Canelo. When Jacobs fights aggressively like he did in round 12 against Maciej Sulecki last April, he’s hard to beat. That’s the way Jacobs fought against Peter Quillin and Sergio Mora. Jacobs is a top-notch fighter when he’s in that mode, but he looked afraid for the first 11 rounds against Sulecki, and he also fought like he was afraid most of his two prior fights against Luis Arias and Golovkin. If Jacobs fights like that against Canelo, he’ll surely lose. Canelo will make sure he lands two or three hard shots in each round, and the judges will respond by giving him the decision. Jacobs has to go after Canelo, because he’s fighting the most popular fighter in North America. You don’t beat the most popular guy unless you administer a real beating to them. ”Canelo would make more in a GGG fight than he will against Daniel Jacobs so that goes both ways,” Loeffler said.